When extraction technique was applied for the first time as a hair transplant technique, extracting follicles and implanting them was done using simple manual tools. Later on, the procedure was accelerated by introducing a machine known as "micro motor" that was used during extracting follicles step and implanting follicles. This instrument allowed doctors to transplant more follicles by improving the extraction process. Nevertheless, micro motor has many disadvantages when using it to implant follicles. Currently, a new technique has been introduced, it depends on a new type of tools: transplant using (Choi implanter pens). What are Choi Implanter Pens? And How do they Work? 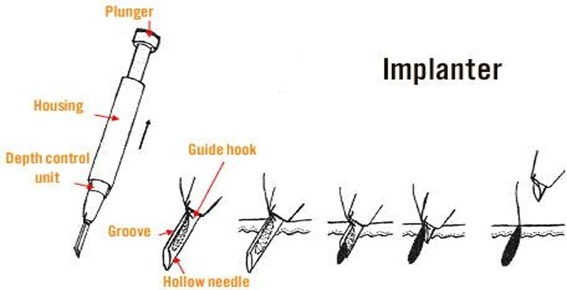 The idea of Choi implanter pen originated from the Kyungpook National University in Korea, the idea behind this technique is simple: to combine making channel incision sites in the recipient area and implanting the extracted follicles in one process. Choi implanter pen is a pen-like device with a hollow needle at the tip of it and connected with a tube and a plunger. During hair transplant using Choi implanter pen, the doctor loads the follicles extracted from the donor region into the implanter pen, the follicles are put gently, using tweezers, inside the hollow needle (at the end of the implanter pen). Then the pen is used to implant the preloaded follicles into the scalp, the doctor inserts the needle at an appropriate angle into the scalp (making a channel incision site) and implanting the follicle by pressing down on the plunger. This process is then repeated to implant one follicle at a time. During a typical transplant procedure, the doctor performing the procedure and the medical team working with him use about 6 implanter pens alternately to get the best transplant result in a more timely manner. Each of these implanter pens is equipped with various sizes of needles to fit single, double and triple hair follicle units. Using implanter pen for hair transplant, there would be no need to open channel incisions. The medical team previously needed to create tiny circular channel incisions in the head scalp and implant the follicles inside of them. The doctor can now inject the follicles directly into the recipient area without the need to open the channel incisions, reducing trauma and bleeding during the hair transplant procedure. As a result, doctors can now get higher rate of healthy follicles that stay viable and produce healthy hair later on after the hair transplant procedure. In addition, this technique reduces trauma, resulting in faster healing for patients. There is obvious and significant evidence of better aesthetic results, as follicles can be transplanted more accurately during the procedure. Below is a comparison between traditional hair transplant method with extraction and hair transplant with extraction using Choi implanter pens. Follicles are extracted individually (one follicle at a time) directly from the back of the scalp randomly using specialized tools. When extraction is done correctly, this technique doesn't leave any scars. The donor area heals faster than in old traditional methods. Extracted individual follicles are implanted into the previously created channel incisions. The doctor creates channel incisions in the scalp and then implants the extracted follicles in these incisions. The incisions created in the recipient area in addition to transplant trauma slows recovery, which also leads to lower surviving follicles rate. Individual follicles are preserved in high platelet-count solution. Then the follicles are loaded into a syringe shaped instrument and implanted directly into the scalp without the need to create channel incisions in the donor area, thus avoiding the trauma in the scalp. Using implanter pen increases surviving follicles rate. Using the Implanter Pen to Increase Density:There is a major advantage of implanter pen technique, it is easy to increase hair density by implanting the follicles between the existing hairs. Many patients who were seeking hair transplant as a hair loss treatment abandoned the idea because the hair should be completely trimmed of before starting the hair transplant. This was necessary when micro motor was used to create the channel incisions before implanting the follicles. Using Choi implanter pen, the hair existing in the recipient areas no longer needs to be shaved. Choi pens can be used to inject the follicles between the existing hairs easily. This method of transplant has another major advantage, when follicles are re-planted between the existing hairs, the doctor can clearly see the natural angle of hair growth, and he can perfectly position each follicle to match the existing hair. These unique advantages of transplant using Choi implanter pen provides an exceptional benefit for beard and eyebrows transplant, as the used technique gives the patient better aesthetic results in terms of density and appearance. The most important thing is that it guarantees that there would be no scars on the face since no incisions were created in the procedure. "There are no advantages or disadvantages, it's all about the tools that doctors use to carry out the hair transplant procedure. If you're good at using these tools it will reflect on the procedure you're carrying out. Choi pen, Neograft, Artas.. etc. and all those techniques are just tools, you don't have to use any of these tools to get great results. You may use all these techniques and get bad results"
According to the medical team at Clinicana hair transplant center in Istanbul, Turkey. Getting a high rate of viable healthy follicles. Decreasing the bleeding during creating the recipient area. Decreasing the risk of an infection. Reducing trauma during follicles transfer, and causing less damage in the blood supply to the implanted area. 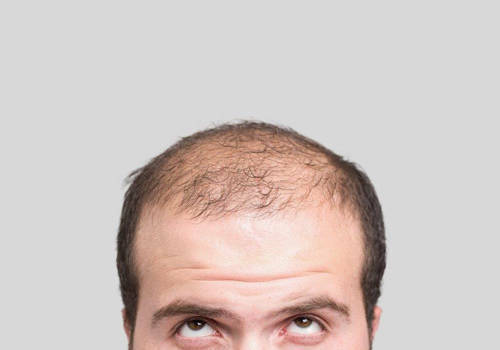 Faster recovery after the hair transplant procedure. Reducing time of procedure (with a medical team experienced in Choi implanter pens technique) as creating the incisions and implanting the follicles are combined in one step. The doctors and medical team should undergo a longer training period to master working using this technique. The medical team should consist of six persons at least for each procedure. The procedure may take longer time if the team was unfamiliar with this method. The cost of the procedure is generally more than that of conventional extraction method due to the cost of Choi implanter pens. This procedure requires more accuracy and attention during the procedure. Is Transplant Using Choi Pen Considered Suitable for All Patients? According to hair transplant experts, not all people are ideal candidates for hair transplant with extraction method using Choi implanter pens. After creating this method in Kyungpook National University in Korea, it began producing good results in Asian people with hair loss and became a popular method in Asian countries. Although hair transplant using Choi pens have shown good results in Asian people, doctors have noticed less success in other races. Experts have studied this phenomenon and reached the following result: Asian people's hair in general is distinguished with thick straight hair, unlike the curly hair with thinner diameter of other races, which can't be loaded properly into the needle of Choi pen and implanted it in the scalp. This may lead to inappropriate bend in the follicle, incorrect implant placement, and an excessive trauma for the follicles. Therefore, Choi pen method is not considered appropriate for all patients who want to undergo hair transplant. It is important to consider that the it's the doctor, not the used tools, who determines the results of hair transplant. Even more developed tools may lead to poor results when they're used by unqualified doctors. Choi pen may produce good results when they're used by a skilled doctor, well-trained to use this method. Before taking a decision to undergo hair transplant using Choi implanter pan, patients should know that this methods has many advantages and disadvantages, and that not all people are good candidates for hair transplant using this method (especially those of non-Asian descent).